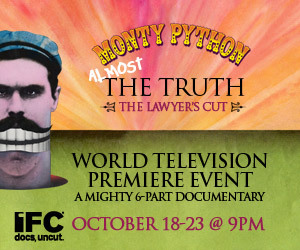 Starting this Sunday night, IFC will be airing the 6-part documentary Monty Python: Almost the Truth (The Lawyer's Cut). It's an exhaustive start-to-finish history of the groundbreaking comedy troupe, featuring interviews with the original members, archival footage and conversations with people they've worked with and influenced over the years, like Lorne Michaels, Eddie Izzard and Stephen Merchant. This is the documentary I always hoped that would be made -- something so complete and so faithful to the truth that I don't need to watch it. Six hours of in-depth Python interviews and never-before-seen material? I think I just soiled my Spanish Inquisition robes in excitement. To celebrate the premiere of the documentary, last night the Ziegfeld Theatre in NYC hosted the remaining members of Monty Python (plus a cardboard cutout of the late, great Graham Chapman) for an extensive audience Q&A -- full video after the jump.